John (Jack) Shea is a consultant with decades of experience in providing theological and formation services to parishes and faith-based organizations. He has published over twenty books of theology and spirituality, three novels, and three books of poetry. He lectures nationally and internationally on storytelling in world religions, faith-based health care, contemporary spirituality, and the spirit work movement. Visit jackshea.org to learn more. Mark McMahon has been documenting people and their environments nationally and internationally for more than forty years. His on-location works are included in museums, exhibitions, private and corporate collections. He is a second-generation Chicago artist. "A nice little book of poems for Advent and Christmas that takes some unusual twists. One can truly feel and see with his specifics. They raise Shea's poetry into a higher sphere that leaves an image stamped in your brain." "Shea's gift within these pages allows each of the many characters in the birth narratives in the gospels of Matthew and Luke to fascinate our imaginations and sooth our faith. Find your most comfortable chair, allow the music of the season to play in the background, pour yourself some warm apple cider, and allow Shea's work to speak to your mind and heart, revealing the joyful message of Emmanuel, God-with-us." "These poems speak through their characters. A poem on Anna and Simeon encourages readers to `sip the epiphany of the eggnog' and ends with eucharistic imagery, skillfully interweaving the earthly with the sublime." 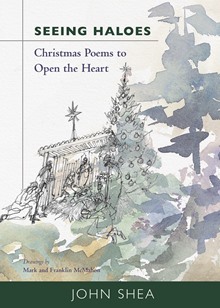 "These wonder-filled poems dance in my soul, a reminder that the Christmas story always has more to tell us."